No this is my second year on the fund! last year was a real help and once again this year its going to be a massive help with helping me live more comfortably in general and help me concentrate on riding my bike and help with having a better diet by allowing to get more quality stuff. I started cycling when i was quite young, around the time of the 2008 Olympics. My grandad got me into it originally, we used to descend down a mountain in the French alps to get breakfast on our moutain bikes. Then he build me a road bike and i joined Halesowen cycling club and rode on the road and the track, watching the like of Bradley Wiggins, Chris Hoy and Nicole Cooke do so well in Beijing it inspired me to ride more. We live together at some points of the year. We come here to the Algarve in Portugal for a 10 week camp where we train really hard for 7 weeks then the last 3 weeks we have races in Portugal and Spain. 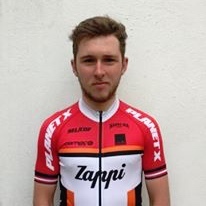 Then we move to Italy where we race anyhitng from 1-4 times a week in big UCI 1.2 races, We are coached and mentored by ex-pro Flavio Zappi who stays with us all year round. Its a very down to earth team with very old school morals of working hard eating clean and racing smart. A lot of UCI 1.2 races in Italy such as U23 Milan San Remo and Giro d Lombardia, then towards the start of the summer we have a few UCI 2.2 stage races in France and Italy such as the massive Vale d Aosta, and maybe a week long stage race in Slovakia. In between we are racing in Belgium, Portugal, Spain, France and England.